It’s a long way away from the annual Cherry Blossom Festival. That won’t happen until June 30 next year. 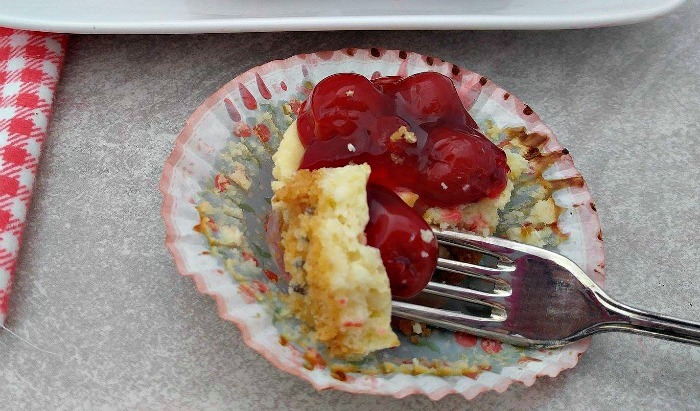 But this recipe for mini cherry cheesecake cupcakes is a dessert that I love year round. I have recently discovered that one of my favorite fruits in cherries. I don’t know what took me so long to figure out what a great fruit it is, but now I am hooked. 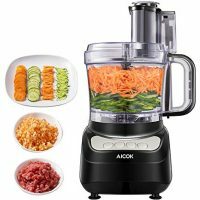 I love to eat them fresh and also used canned cherry toppings in many recipes. These cherry cheesecakes are the perfect dessert for those of you who love cheesecake recipes as much as I do, especially if you can’t trust yourself around a whole cake! These individual sized little bits of heaven are easy to make, delicious to eat and a hit any time of the year. The only problem you may have is limiting yourself to just one of these yummy dessert treats. If you love cherries like I do, check out these chocolate cherry macaroons for a lighter sweet treat. 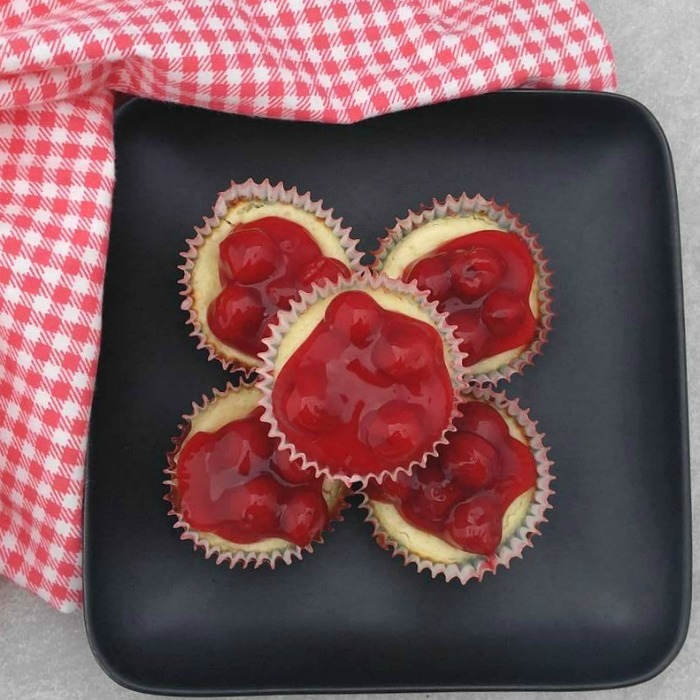 With Valentine’s Day just around the corner, these mini cherry cheesecake cupcakes are the perfect ending to a romantic dinner for two to celebrate the holiday. 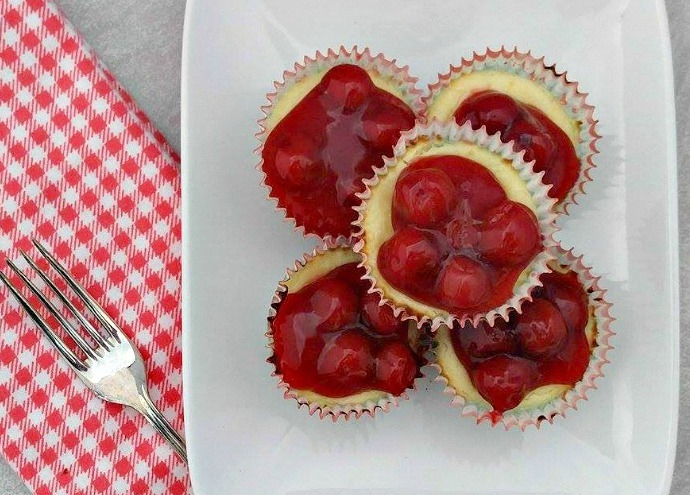 This Mini Cherry Cheesecake recipe is super easy to make. The recipe has everything going for it. It’s made with just a few ingredients, is lovely to look at and tastes out of this world. Start by making the graham cracker base. I used a food processor and combined the butter. 1/4 cup of sugar and the graham crackers together. 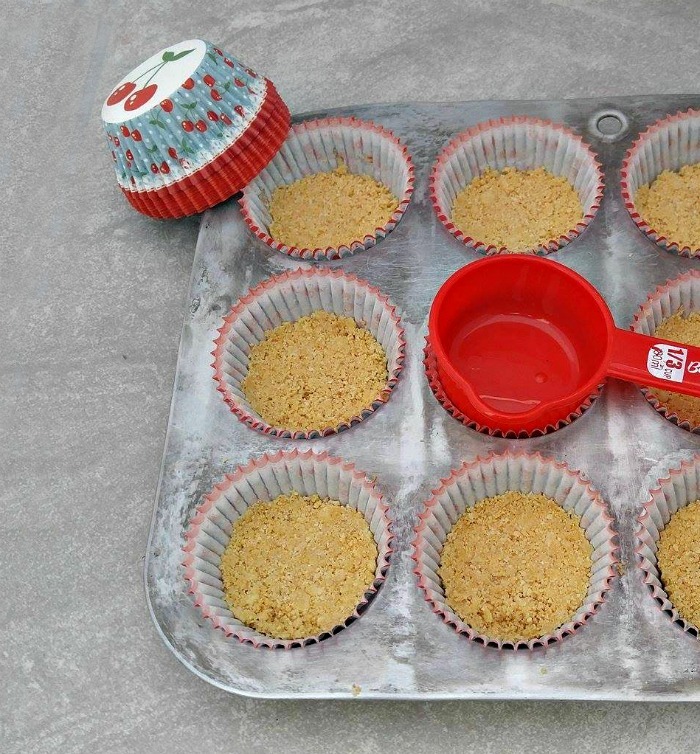 Press some of the crust mixture into each of the cupcake wrappers. 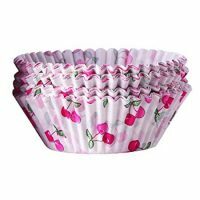 How cute are these cherry cupcake liners? My husband is fond of giving me bits and pieces that I can use for crafting and cooking on my blogs as gifts, and I knew just what I was going to make when I opened this present! TIP: a small measuring cup makes the perfect tool to press down the bases. These are baked for 5 minutes while you prepare the filling. Yup, it’s that easy! 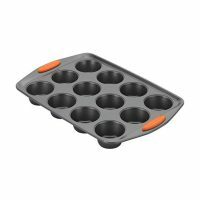 In the bowl of a stand mixer, combine the filling ingredients, then fill the cupcake liners 3/4 full. I used a small cookie scoop that holds about 3 tablespoons, and it was the perfect amount for each cupcake. Once the filling is in each one, bake them for another 17 minutes. Top the cherry cheesecake cupcakes with some of the cherry pie filling, trying to get at least 3 or 4 cherries on each cupcake. 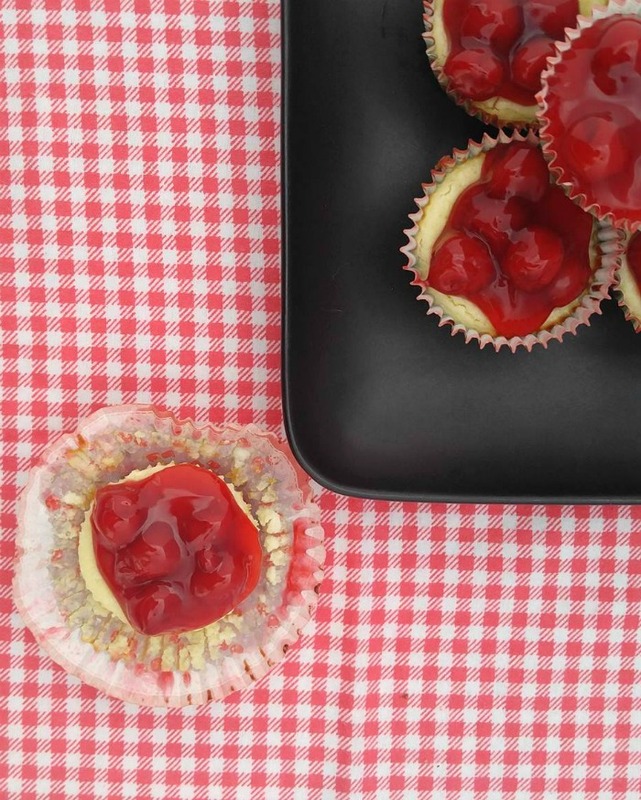 Each bite of these amazing cherry cheesecake cupcakes is a little bit of heaven. The graham cracker crust is sweet and buttery, and the cupcakes themselves? I love that these sweet treats are portion controlled, and EVEN BETTER, you can freeze them. Although I have been known to eat frozen desserts right from the freezer, it does make it harder to break your diet! If you have ever been intimidated by the idea of making cheesecake, you no longer have an excuse! 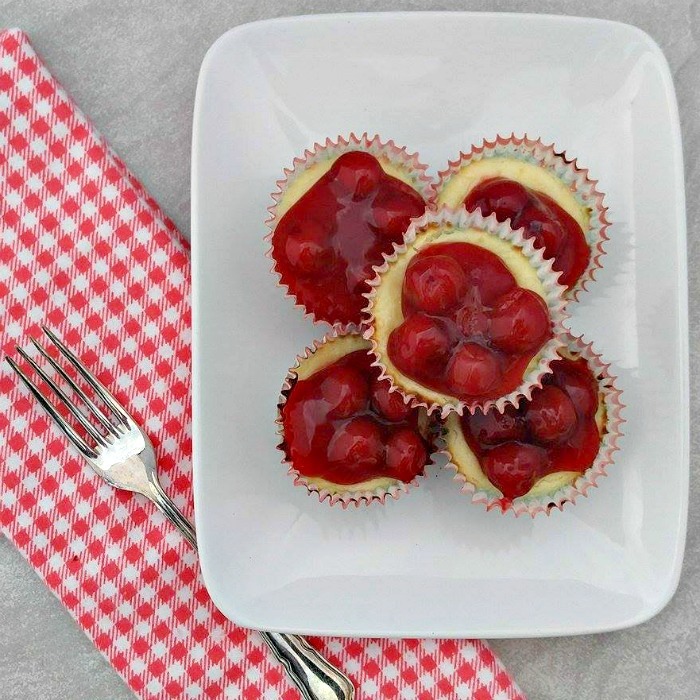 These cherry cheesecake cupcakes are one of the easiest desserts that I make. What are you waiting for? Also, check out this lightened up chocolate cherry cheesecake. It’s another winner! 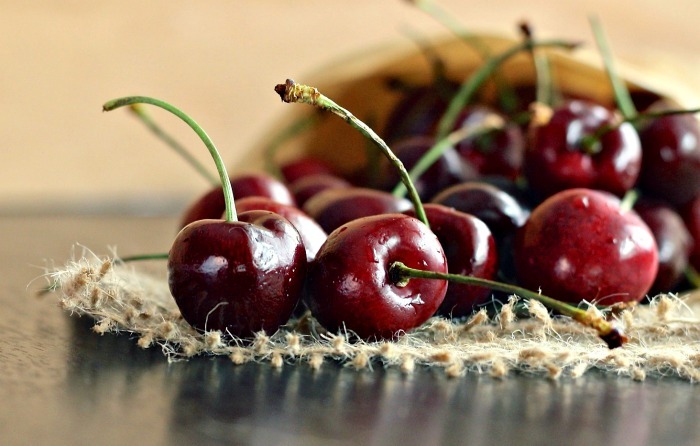 Do you like using cherries but don’t want to pit them? See how to easily pit cherries with a common household item. 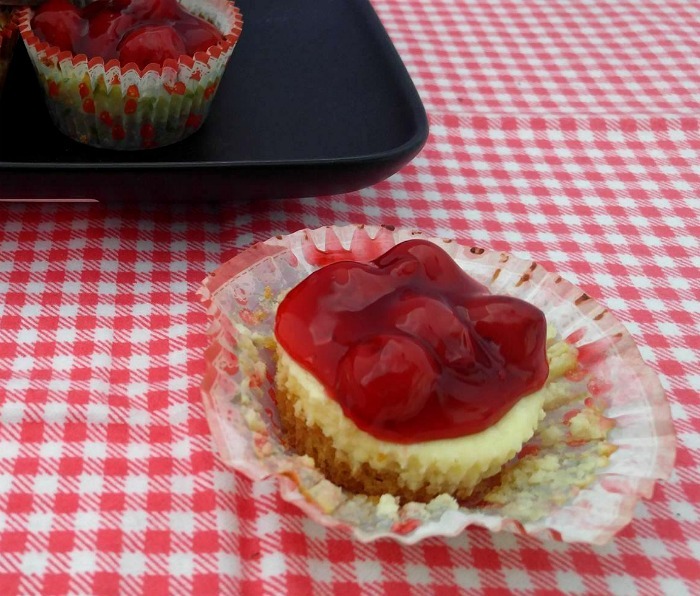 Would you like a reminder of this recipe for mini cherry cheesecakes? Just pin this image to one of your Pinterest dessert boards so that you can easily find it later. 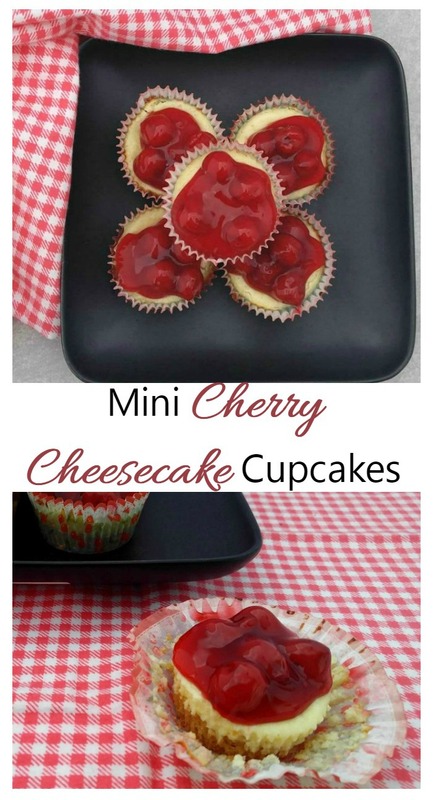 Admin note: This post for mini cherry cheesecakes first appeared on the blog in January of 2017. I have updated the post with a new recipe card, nutritional information and a video for you to enjoy. 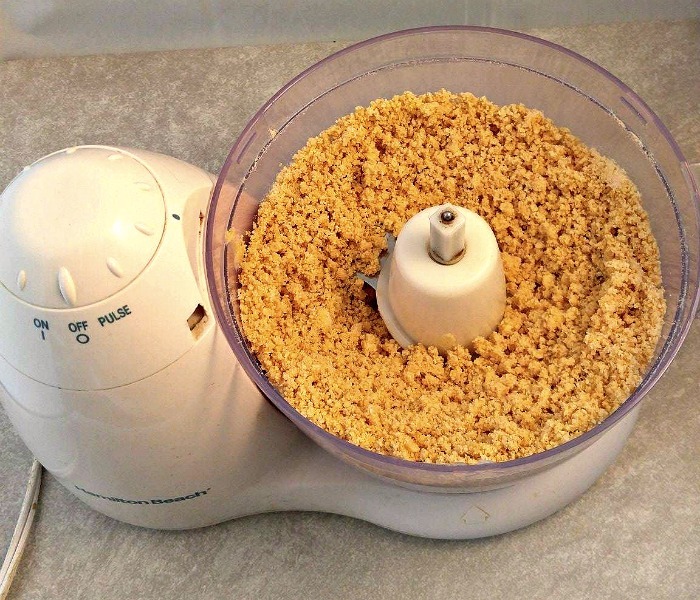 Use a food processor to combine the butter. 1/4 cup of sugar and graham crackers together. 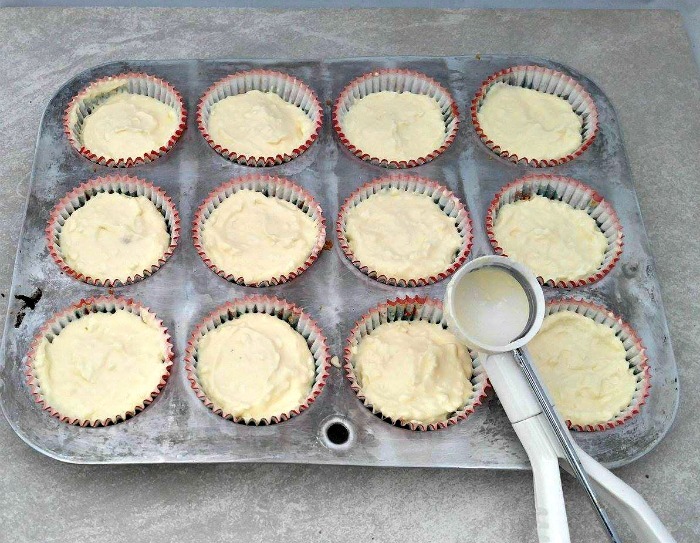 Press 1 1/2 tablespoons of the crust mixture into each of the cupcake wrappers. Bake for 5 minutes while you prepare the filling. 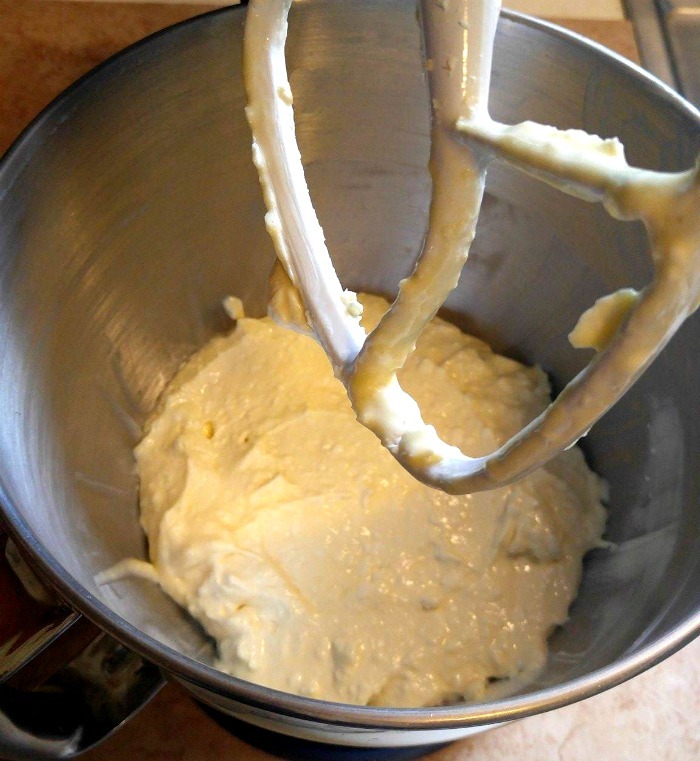 In the bowl of a stand mixer, combine the filling ingredients. Fill the cupcake liners 3/4 full and bake for another 17 minutes. Top the cherry cheesecake cupcakes with some of the cherry pie filling, trying to get at least one cherry on each cupcake. Cool in the fridge until set. Heat the cherries sugar and water and bring to a boil. Combine the cornstarch and lemon and add to the mixture. Stir till thick, then cool and use.